Unusual coenzymes are often needed to perform particularly difficult enzymatic tasks. For instance, methane-forming archaea must transfer electrons from hydrogen to carbon dioxide when they perform their major energy-producing reaction. However, the normal carriers of electrons, NAD and FAD, don't have the proper redox potential to perform this reaction. So, these archaea use the coenzyme F420, which is chemically similar to FAD, but with a few changes that tune the redox potential into the necessary range. F420 (shown at upper left) is named for its strong absorbance of violet and ultraviolet light (strongest for wavelengths around 420 nanometers). When irradiated with ultraviolet light, it fluoresces with a colorful blue green light. This is so bright that methanogenic archaea, which use F420 as their primary electron carrier, are easily recognizable by their colorful fluorescence. F420 is used for several specialized tasks that require its unique electron transfer properties. As mentioned above, in archaea it is an essential tool for the conversion of carbon dioxide to methane. It is also found in bacteria, where it assists in the synthesis of antibiotics like tetracycline and lincomycin. A modified form of the cofactor is also used by cyanobacteria in the repair of DNA damage. In these cases, the cofactor absorbs ultraviolet light and uses the energy to separate the bonded bases in pyrimidine dimers. Structures of the two enzymes that perform the final steps of synthesis of F420 have recently been solved by groups in the PSI, giving us the first look at how this unusual cofactor is constructed. F420 is composed of four parts: a flavin-like F0 ring, a phospholactate (PL), and two (or occasionally more) glutamate amino acids. The enzyme 2-phospho-L-lactate transferase (shown here at the bottom from PSI KB entry 3c3e, solved by NESG and collaborators) attaches the F0 ring to the phospholactate. It uses a GTP-activated form of the phospholactate to power the reaction. The structure includes the F0 ring (shown in pink) and a GDP (shown in orange), revealing the location of both substrates in the reaction. The final step in F420 synthesis is the addition of two glutamate amino acids to the cofactor, performed by the enzyme F420:gamma-glutamyl ligase (shown at top right from PSI KB entry 2phn, solved by MCSG and collaborators) The structure shows a dimeric enzyme with two deep active site grooves. A GDP molecule is found in each groove (shown here in orange), positioned by manganese ions (shown in magenta). 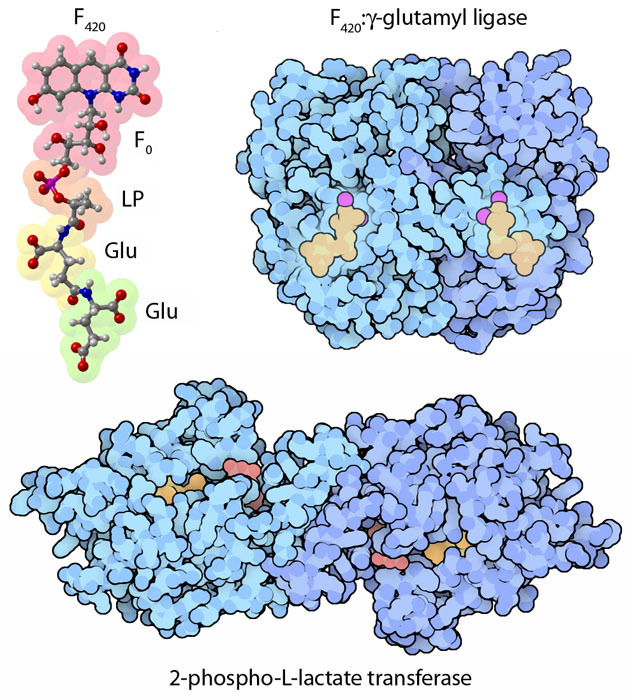 The enzyme F420:gamma-glutamyl ligase shows a new protein fold. 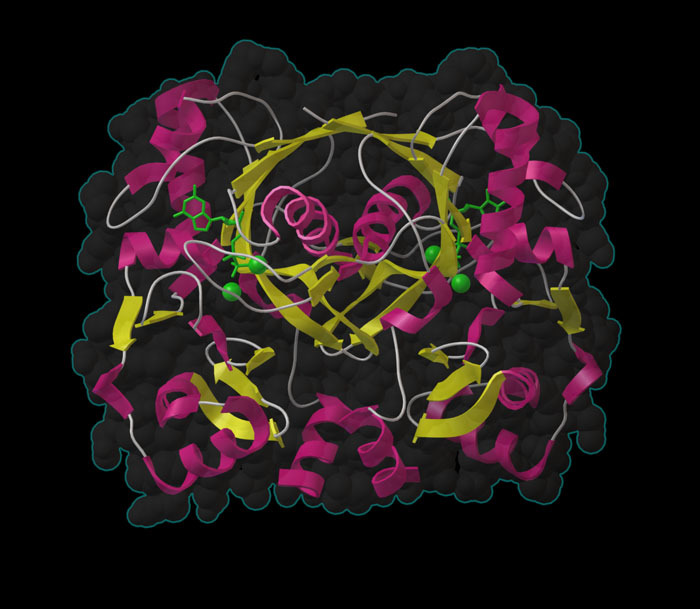 A ribbon diagram is shown here, with beta sheets in yellow and alpha helices in magenta. GDP and manganese ions bound in the two active sites are shown in green. Notice the large beta-barrel at the center, surrounding two alpha helices. One of the goals of structural genomics is to discover proteins with new folding patterns. Based on its amino acid sequence, researchers at MCSG chose to study F420:gamma-glutamyl ligase because it was predicted to be different than any existing structures. When they solved the structure, it did show a new fold, and represents an entirely new family of enzymes. The fold shows an interesting formation at the interface between the two protein chains, with a large beta-barrel (beta strands are shown in yellow here) surrounding two interacting alpha helices (alpha helices are in magenta). This structure is available at the Protein Data Bank in entry 2phn. This illustration was created with the Python Molecular Viewer. For a high resolution tif image, click here. B. Nocek, E. Evdokimova, M. Proudfoot, M. Kudritska, L. L. Grochowski, R. H. White, A. Savchenko, A. F. Yakunin, A. Edwards and A. Joachimiak (2007) Structure of an amide bond forming F420:gamma-glutamyl ligase from Archaeoglobus fulgidus: a member of a new family of non-ribosomal peptide synthases. Journal of Molecular Biology 372, 456- 469. F. Forouhar, M. Abashidze, H. Xu, L. L. Grochowski, J. Seetharaman, M. Hussain, A. Kuzin, Y. Chen, W. Zhou, R. Xaio, T. B. Acton, G. T. Montelione, A. Galinier, R. H. White and L. Tong (2008) Molecular insights into the biosynthesis of the F420 coenzyme. Journal of Biological Chemistry, in press. E. Warkentin, B. Mamat, M. Sordel-Klippert, M. Wicke, R. K. Thauer, M. Iwata, S. Iwata, U. Ermler and S. Shima (2001) EMBO Journal 20, 6561-6569. A. A. DiMarco, T. A. Bobik and R. S. Wolfe (1990) Unusual coenzymes of methanogenesis. Annual Review of Biochemistry 59, 355-394. D. E. Graham and R. H. White (2002) Elucidation of methanogenic coenzyme biosyntheses: from spectroscopy to genomics. Natural Product Reports 19, 133-147.